The Department of Housing and Residence Life Services is hosting 2 information sessions where you will learn about this leadership opportunity, and more details on the role and application process. These sessions are a great opportunity to ask questions, meet our professional staff, and determine if the Residence Fellow role may be a fit for you. We will be hosting our first information session on November 21st. More details, including time and location will be provided when we officially launch our hiring campaigns. All Residence Fellows will participate in Spring Orientation on the evening of March 22nd, which prepares them for the upcoming year. Residence Fellows also receive a week and a half of intensive training at the end of August. During this training they are taught the skills necessary to be successful in this role. 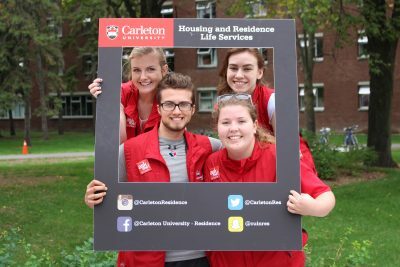 The Department of Housing and Residence Life Services also provides ongoing training opportunities for the Residence Fellows throughout the year in order to support them with meaningful personal and professional development. What would I gain from this role? Through August Training and ongoing training sessions, Residence Fellows gain SafeTalk designation, diversity training, LGBTQ+ awareness and education, Upstander – bystander support, and a network of campus partners. Residence Fellows also develop a number of transferable skills including, but not limited to team work, leadership, communication, critical thinking, problem solving, conflict resolution, and mediation. What if I am on exchange during the interview process? Being on exchange during the interview process should not prevent you from applying or being considered as a Residence Fellow. Please contact Blanka Vallillee at blanka.vallillee@carleton.ca if you are on exchange during the hiring period. Alternative interviews will be held to in late January 2019.